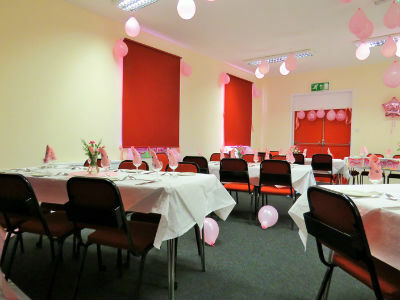 Subject to availability our premises are available for hire and have been used for various events including small scale celebrations, training courses, church retreats, funeral teas and meetings. The Hall has been recently refurbished and has a well equipped adjacent kitchen. Size: The Main Hall is 14m x 7.5m (at its widest point). It is therefore unsuitable for events involving large amounts of equipment. Hire Capacity: The maximum amount of people that the Hall may be hired for is 50 people (adults and children). Age restrictions for Parties: Due to some recent unhappy experiences we have sadly had to restrict all 'Outside Hire' of our facilities to parties of children that are of PRIMARY SCHOOL AGE (12 years old and below). Please note that evening parties for children must finish (including clearing up) by 7pm. 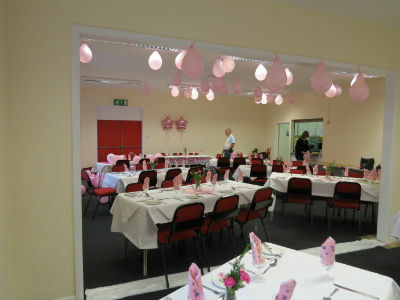 We do not hire our facilities for any parties for any other age group. Use of Hall: Users are expected to recognise that these are church premises and we therefore cannot allow it to be used for activities that conflict with or contradict the teachings or policies of this church, such as Halloween parties, Psychic events, gambling or non-Christian worship. The Hall is not suitable for most bouncy castles and those wishing to have them in the grounds will need to have their own insurance against injury. We will then email/post (as appropriate) our Hall Hire Application Form and also the terms and conditions of hire. Once you have read and signed the Terms and conditions of Hire and returned them to us, We will consider each application and will get back to you when an application has been approved. PLEASE NOTE THAT NO BOOKINGS WILL BE CONSIDERED FIRM UNTIL YOU HAVE RECEIVED WRITTEN CONFIRMATION FROM THE CHURCH BOOKING COORDINATOR EITHER IN LETTER OR EMAIL FORM.